I got this quilt finished up last night, and I am very happy with it. I've mentioned that I really like anything American Jane, but I am so crazy about these doll clothes, cute! I ended up piecing the back of this quilt, I am really trying to NOT buy fabric--I want to use what I've got--No, I must use what I've got. and all 4 baby quilts stacked (my favorite) together. Super cute!! That doll clothes fabric makes smile. Stinkin' adorable! I LOVE the fun fabrics you use! That stack of 4 finished baby quilts just makes me smile ;-) Well done! I love it! How big are your blocks? Beautiful! 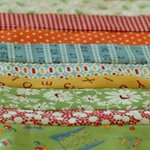 What lucky babies they will be to snooze under your lovingly-made quilts! georgeus!!! i am really trying to not buy fabric too, but is very dificult!! Very cute! love the fabric! rachael adele, the finished blocks are 6 inches. 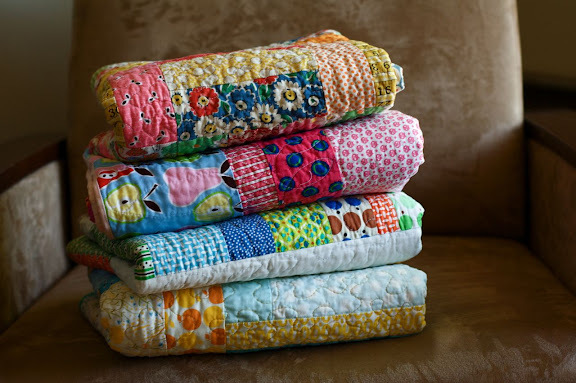 I'm a full time cross stitcher, part time quilter and I must say these baby quilts are so adorable. You quilters just inspire me to want to quilt more often. ur quilts r so cute. i'm lovin' american jane, too. where do u find the time to complete so many quilts? You have been so productive! 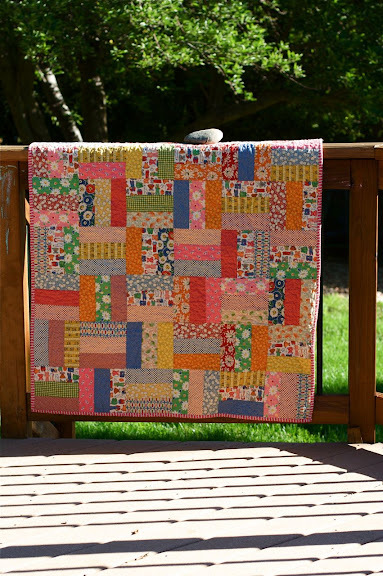 I love a cute rail fence quilt. A classic! Super cute! I love the doll clothes too. This is so cute! I love how it turned out and the fabric is great! I love that quilt. Amazing how different it looks post quilting! So cute!! And that final photo of a pile of cuddly quilts is great!! What a great quilt! Those fabrics are perfect for a baby quilt! These look great!! I have so much wee play that I'm going to have to do this quilt in baby size! I really, really, really like American Jane also!!! LOVED the red polka dot they had. I still have a few yards left for a few more quilts. :) They are super cute quilts and the people getting them will be thrilled!! The all turned out so pretty. I especially like the scrappy rails. The quilting made all the difference! That is absolutely stunning! I love them all folded on top of each other. oh, nettie! it's so gorgeous!!! i need to make more baby quilts. and use more scraps. so this would be the perfect solution! Lovely! What color thread did you use to quilt with? It blends in so nicely on all the fabrics. Well...it's just w-a-y too cute for words!! So cute, nettie. I think I may have to shamelessly copy you on this one. Three cheers for American Jane! I think the scrappy rail is my favorite out of the stack. Although having a favorite might suggest I also have a least favorite...and that's just not possible with the work you do. You should be very happy with it. Nice choice of fabrics and combinations. Sua colcha baby está maravilhosa. Aliás como todos os seus trabalhos. 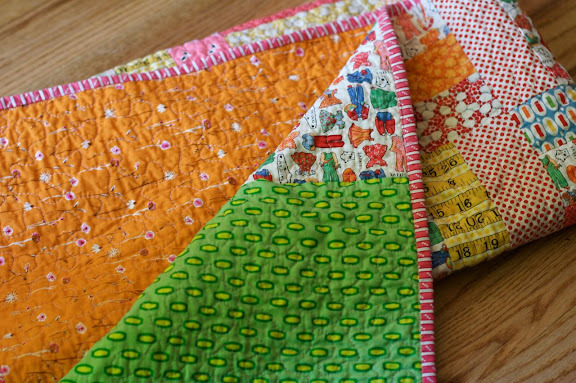 Your quilts look great...I have one question for you though...when you have a different coloured back from the front do you use two different coloured threads when quilting? Thanks! this is amazing, Nettie! :) How big is the finished quilt? So adorable! 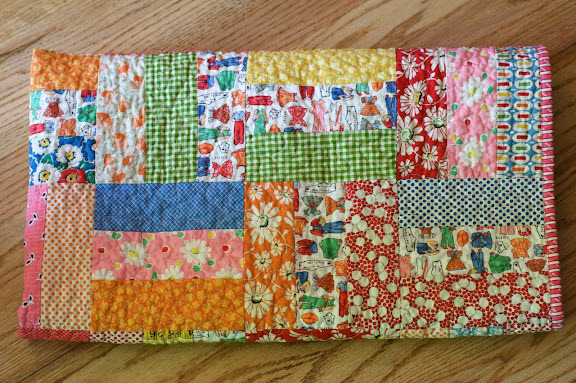 I've been thinking about making rail fence baby quilt for a shower at work. I think that yours has come out wonderful! the quilt is very,very lovely. Lovely! Oh, please do so that aqua/orange quilt once the recipient has seen it. I LOVE that color combo! Shut up. I love those quilts. I love this one. Did you use a jelly roll? Your quilt is beautiful! I love to piece the backs, even though it is more work, they are much more interesting and as you said, it uses up the leftovers! I wish I could just finish the ONE baby quilt I've been working on for the past week! I really like the fabrics you chose too! They are all just fabulous! I adore American Jane too. Just love it in your quilt. 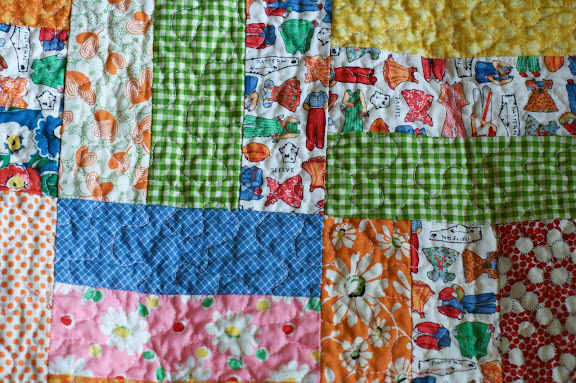 i love the vintagey colors of this adorable quilt. the pattern is great too and i love the doll clothes fabric as well. cute! It is so cute. ou are right - it looks wonderful in a stack. Your sewing always inspires me. Thank you so much for sharing photos of your work. I want to run upstairs to my sewing room and get started on something new after I look at your blog! You inspire. I love all your work. I love it when you post photo's. I am glad you 'had time' to quilt. I love your profile. I wish I had more time. Have a Blessed weekend. btw you have made me a fan of triple rails. You must be thrilled with them!! so cute!! i love american jane prints! It is so cute in this snippets fabric. I love it. It speaks to me. I'm so glad to find someone else who has quilt love! I just posted some sweet little quick and easy little sundresses I made for my 8 year old daughter with instructions on how to do it yourself, and I recently made a maxi dress for myself from a 1974 pattern I found in an antique store. Love it! It should be called happy scrappy. i love those american jane fabrics too. this turned out so great! good luck with the using what you have on the fabric front. i need to do that too! I'm totally in love with the materials you use. Great fabric choices. You are so creative. Hi! What are you using for your batting? I am making my first quilt right now, and am finding my batting (a bamboo mix) is just too thick. It'll be nice for a winter layer but for summer I'd really like something thinner. Your blog is eye candy and inspiration galore! Great projects. Love this one too. Very nice indeed.